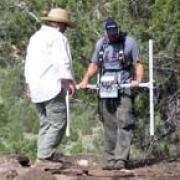 Each summer since 2003 the U of U Archaeological Field School provides student's instruction in archaeological method and theory, Fremont Culture history, basic GPS and GIS technology, survey methods, and excavation techniques. Graduate students, especially those with an archaeological focus, are encouraged to participate in the Range Creek Research Project by designing and implementing projects compatable to their research interests. Projects exploring the costs and benefits of hoarding behavior, GIS based catchment analysis, ceramic sourcing, vandalism prevention are just a few of those that have been implemented. 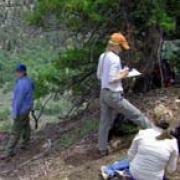 The U of U Geography Department offers a 10 day field course Paleoenvironmental Field Methods for Geographers conducted in conjunction with the archaeological field school. Led by Professor Larry Coats the program is designed to teach methods used by paleo-researchers to reconstruct past environments on local and regional scales. 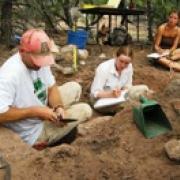 Students receive training in a variety of field techniques including survey and mapping with an emphasis on sample collection, description and analysis. Under the guidance of Professor Cari Johnson, the Sedimentary Geology Research Group at the University of Utah is studying the geology of Range Creek. Rocks exposed in Range Creek Canyon are Paleocene to Middle Eocene age (~65-45 Ma), ranging from the Paleocene Flagstaff limestone (exposed at the south end of the canyon) to the Paleocene-Eocene Colton Formation. 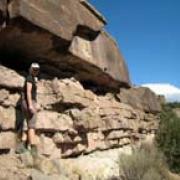 Eocene Green River Formation is exposed in the Valley Mountain plateau area, above ~2600 m elevation. Beginning in 2011, the Field Station has coordinated monitoring studies designed to provide quantitative baseline data to better manage its conservation values.